We empower students to pursue their passions through education. For more than 20 years, we have worked to create a world where opportunity is universal and potential is limitless. With an unwavering commitment to impact an entire generation, our mission is to empower students to pursue their passions through education. We are pioneers in positive youth development, encouraging self-advocacy skills in young people. Our programs foster a growth mindset, instilling in students the strength and skills to persevere and define their own path. 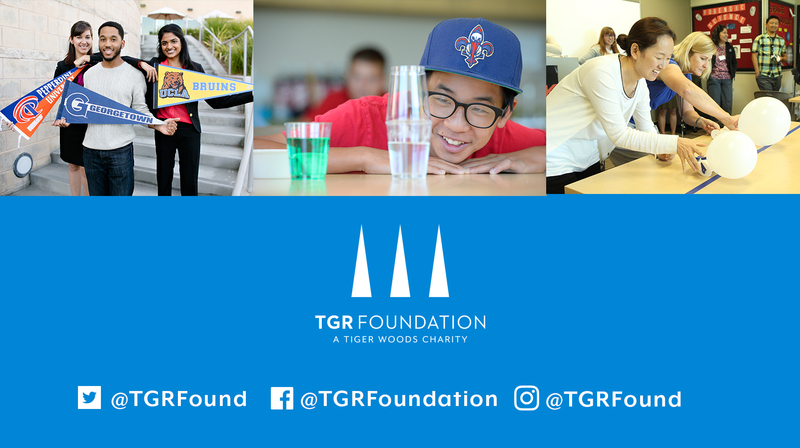 Through our award-winning STEM curricula, college-access programs, digital platforms and educator professional development, TGR Foundation offers underrepresented students the resources and support needed to thrive in school and beyond. When the foundation launched in 1996, I was 20 years old. I knew our junior golf program and the grants were having a positive impact, but the tragedy of 9/11 made me realize we needed to do more. I wanted a permanent, safe space for kids to explore their dreams. From there, we created the TGR Learning Lab in Anaheim and the Earl Woods Scholar Program, honoring my dad. Over twenty years later, the results speak for themselves. We worked in STEM before it was a common acronym. To date, the TGR Learning Lab has served more than 165,000 students. We’ve introduced 85,000 girls to STEM careers and reached 1,000 educators annually, bringing them professional-development programs in STEM education. We’ve also been pioneers in positive youth development, building resilience and developing self-advocacy skills in young people. Research shows this is critical to long-term success in life. We believe that if we give every student access to educational resources and show them that their self-worth is not defined by where they come from or the color of their skin, they will be unstoppable. Our Earl Woods Scholars embody that tenacity, blazing trails to become tomorrow’s innovators, creators and leaders. At 98.7%, we have one of the highest college graduation rates among scholarship programs in the U.S. And our unique one-to-one philosophy provides critical support to our first-generation college students. For the last two decades, we’ve done more for children who have less. And now we’re expanding our reach through TGR EDU: Explore, providing our award-winning programs to millions of students, teachers and families worldwide. Quality educational resources can transform students and schools. They have the long-term power to impact crime, generational poverty and unemployment. I’m dedicated to the growth of this important work. We are just getting started.